Another magnificent and mighty Wisden tome under the expert guidance of Steven Lynch traces back the history of cricket’s most famous rivalry through articles which have appeared in the Cricketers’ Bible throughout the years. Needless to say, it includes reports of England’s victory in this year’s series and gives an idea of what we may expect to read in the forthcoming Almanack. The 687-page book includes match reports, scorecards, records, articles on Cricketers of the Year and a resume of series results. Eagle-eyed readers may quickly notice that the first two Tests played between the two countries – indeed, the first two Tests ever played – have articles written by the well-known Gordon Ross, former editor of Playfair, almost one hundred years after the event but, this aside, usually articles are taken on from the Wisden of that year. 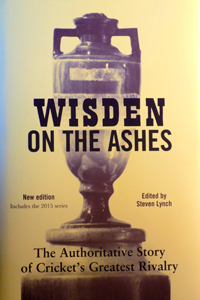 There is understandably great depth to Wisden on the Ashes and it is an ideal companion for anyone wanting a history of the Ashes between the covers of one book and produced by the publishers of the most famous cricketing annual. In addition to the sections mentioned in the previous paragraph, Notes by the Editor and obituaries also appear giving the book the distinct Almanack feel, albeit at almost double the size of the normal Annual. The photographic section, although possibly not containing many rare photos, does, though, bring back many of the finest memories of the Ashes battles throughout the years. As always, it makes for fascinating reading seeing the change of writing styles throughout the almost 140-year period that the Ashes have been contested. It goes without saying that Wisden on the Ashes is once again beautifully presented and is an invaluable book for anyone wanting an excellent history of The Ashes within one book.